The data copyright, license and attribution can be blended on the map using text annotations (mpl docs) as shown in feature_creation. Represents a collection of points, lines and polygons with convenience methods for common drawing and filtering operations. **kwargs – Keyword arguments to be used when drawing this feature. To add features to the current Matplotlib axes, see GeoAxes. The cartopy CRS for the geometries in this feature. Return an iterator of (shapely) geometries for this feature. Return an iterator of shapely geometries that intersect with the given extent. The extent is assumed to be in the CRS of the feature. If extent is None, the method returns all geometries for this dataset. The read-only dictionary of keyword arguments that are used when creating the Matplotlib artists for this feature. Specific Feature subclasses have been defined for common functionality, such as accessing Natural Earth or GSHHS shapefiles. A class capable of drawing a collection of shapely geometries. geometries – A collection of shapely geometries. crs – The cartopy CRS in which the provided geometries are defined. 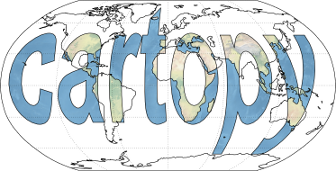 A simple interface to Natural Earth shapefiles. category – The category of the dataset, i.e. either ‘cultural’ or ‘physical’. name – The name of the dataset, e.g. ‘admin_0_boundary_lines_land’. scale – The dataset scale, i.e. one of ‘10m’, ‘50m’, or ‘110m’, or Scaler object. Dataset scales correspond to 1:10,000,000, 1:50,000,000, and 1:110,000,000 respectively. Return a copy of the feature with a new scale. new_scale – The new dataset scale, i.e. one of ‘10m’, ‘50m’, or ‘110m’. Corresponding to 1:10,000,000, 1:50,000,000, and 1:110,000,000 respectively. An interface to the GSHHS dataset. scale – The dataset scale. One of ‘auto’, ‘coarse’, ‘low’, ‘intermediate’, ‘high, or ‘full’ (default is ‘auto’). levels – A list of integers 1-4 corresponding to the desired GSHHS feature levels to draw (default is  which corresponds to coastlines). **kwargs – Keyword arguments to be used when drawing the feature. Defaults are edgecolor=’black’ and facecolor=’none’. A class capable of drawing a collection of geometries obtained from an OGC Web Feature Service (WFS). This feature requires additional dependencies. If installed via pip, try pip install cartopy[ows]. wfs (string or owslib.wfs.WebFeatureService instance) – The WebFeatureService instance, or URL of a WFS service, from which to retrieve the geometries. features (string or list of strings) – The typename(s) of features available from the web service that will be retrieved. Somewhat analogous to layers in WMS/WMTS. Automatically select scale of geometries based on extent of plotted axes. default_scale – Coarsest scale used as default when plot is at maximum extent. limits – Scale-extent pairs at which scale of geometries change. Must be a tuple of tuples ordered from coarsest to finest scales. Limit values are the upper bounds for their corresponding scale. Land polygons, including major islands. Single-line drainages, including lake centerlines. A dictionary of colors useful for drawing Features. The named keys in this dictionary represent the “type” of feature being plotted.